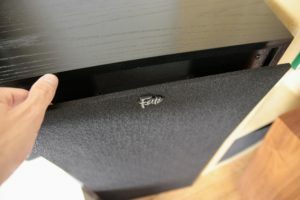 This week we tested the Klipsch Forte III speaker, a 3-way model equipped with acoustic horns and a passive radiator. This uncommon speaker was discontinued almost twenty years ago, and Klipsch brought it back into its catalog in response to growing demand for vintage speakers. This speaker can cover a very large bandwidth and boasts an exceptional sensitivity rating. Equally at home with music and movie soundtracks, the Klipsch Forte III can stand on its own and does not need the support of a subwoofer. It is part of the brand’s famous Heritage range, along with its high-end models. 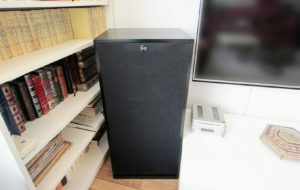 The Klipsch Forte III is 36” (91 cm) tall, 16.5” (42 cm) wide, and only 13” (33 cm) deep. To draw a more concrete image, it is as wide as two classic floorstanding speakers. Its specs are, on the other hand, quite unusual. 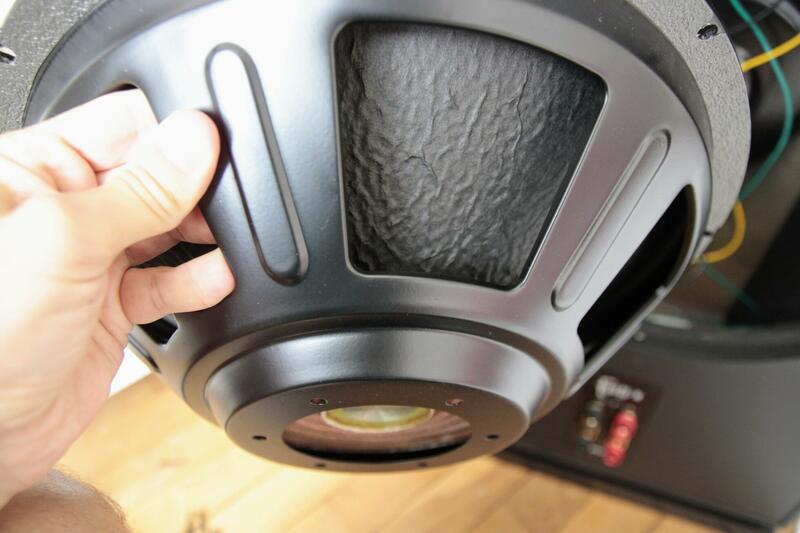 The speaker’s frequency response ranges from 38 Hz to 20 kHz, and its sensitivity rating reaches up to 99 dB (1m/1W). The MDF cabinet features a wood veneer finish and hosts no less than four drivers in a three-way configuration. 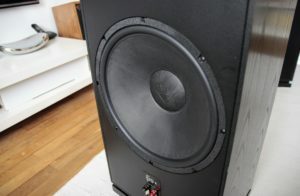 A 12” (30 cm) driver (similar to the one used for the Klipsch Heresy III) loaded in a closed enclosure and paired with a 15” (38 cm) driver is in charge of the lows. The mids are handled by a 1.75” (4.4 cm) titanium dome driver loaded in a newly designed horn, and the highs are covered by a horn-loaded 1” (2.5 cm) tweeter. Of course, all the drivers are manufactured by Klipsch in the United States. 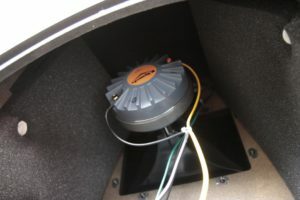 The three active drivers are found in the front while the passive resonator is placed at the back of the speaker, above a set of heavy-duty speaker terminals which allow for bi-amplification. The Klipsch Forte III boasts a sophisticated design and features an acoustically transparent cloth grill crowned with the PWK (Paul Wilbur Klipsch) logo. 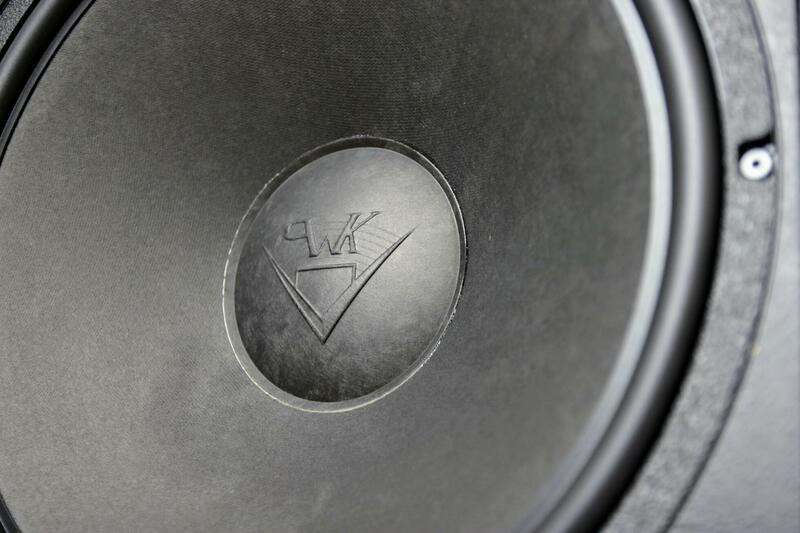 To add to the speaker’s elegant flair, the passive driver’s dust cover is also stamped with the PWK logo. 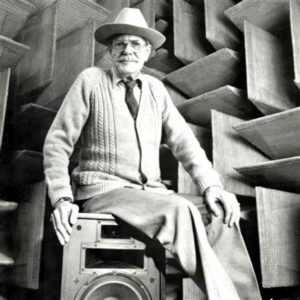 Paul Wilbur Klipsch sitting on the first speaker he designed, the Klipschorn, ancestor of the brand new Klipsch Forte III. 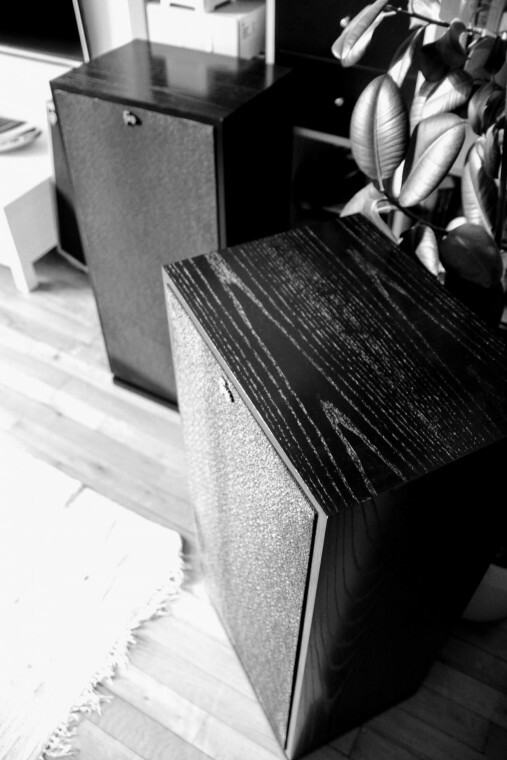 Klipsch Forte III: a high-end speaker for high-end amplifiers? Due to its high sensitivity rating of 99dB, the Klipsch Forte III requires, on average, 8 times less power than conventional speakers to deliver the same sound level. At 1 Watt, the speaker’s output is already largely sufficient for a living room installation. In other words, the Forte III doesn’t need an extremely powerful amplifier to show what it is capable of. While we recommend using an amplifier with a generous power supply to fully exploit the speaker’s potential, a small 10 W amplifier is enough to make this model sing wholeheartedly. Acoustic horns have been Klipsch’s specialty for over 70 years. Back in the 1940s, stereo amplifiers were not very powerful (most of the time ranging between 5 and 10 W). It was therefore necessary to amplify the sound mechanically to reach a decent sound level. Hence the use of acoustic horns, which were designed to increase the volume of a driver by acting as a sort of megaphone. Although modern amplifiers are a lot more powerful -which means a mechanical amplification device is no longer necessary – Klipsch has decided to preserve the tradition, at least for medium and high frequencies (horn-loaded bass drivers would result in gigantic speakers). The Klipsch Forte III’s magnetic grill is composed of wood and cloth. The front panel of the speaker features two acoustic horns and a 12” (30 cm) bass driver. The Klipsch Forte III’s titanium dome compression tweeter’s motor is quite something. Several technologies were developed in order to allow speakers to reach very low frequencies. A closed enclosure, which consists of placing the bass driver in a given amount of air, results in an attenuation of frequencies amounting to about 6dB per octave under the cutoff frequency, which is significant. The lower the volume is, the higher the frequency will be, which prevents the speaker from properly delivering low frequencies at high levels. Rather than incessantly increasing the size of the speaker, various solutions are implemented to efficiently deliver low frequencies. Bass-reflex technology is the most common technique and is based on the use of a bass-reflex port. A bass-reflex port is a tube which allows air to flow in and out of the enclosure, thus creating resonance. This resonance covers the low frequencies which the driver cannot deliver. This technology results in a considerable extension in the lows and limits the movement of the cone when delivering particularly low frequencies. 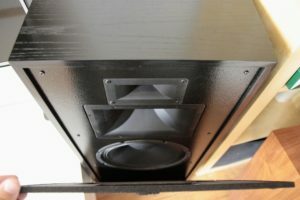 The Klipsch Forte III’s 15” passive driver / radiator. Another possible solution is the use of a passive driver, which is the method Klipsch has adopted for this speaker. The working principle of a passive driver is somewhat similar to that of bass-reflex technology. There is no port here, but a cone whose weight is calculated so that it covers low frequencies when set in motion. Favoring the use of a passive driver over bass reflex technology offers many advantages. The significant size of the resonator’s emissive surface increases the speaker’s output level in the lower end of the spectrum, while only requiring a limited amount of air. As with bass-reflex technology, the active driver doesn’t have to handle low frequencies, as these are handled by the passive resonator. The Klipsch Forte III’s passive driver is very light as it is, quite logically, devoid of magnets and moving parts. Klipsch probably favored this type of enclosure in order to design a “super Heresy” speaker, capable of delivering low frequencies without being–like the Klipsch Cornwall III–as big as a refrigerator. By using a passive radiator, Klipsch was able to design a reasonably sized floorstanding speaker capable of giving the enormous Cornwall speaker a run for its money while ensuring a much greater bass output than the Heresy. This is where issues usually arise. While the passive resonator allows the speaker to reproduce low frequencies using only a limited amount of air, its working principle implies an oftentimes mediocre transient response. 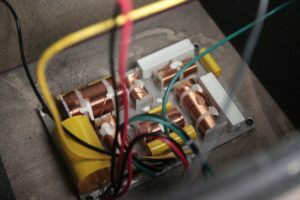 The passive and active drivers are mechanically coupled by the air contained within the enclosure. As a result, the motor of the active driver has to set both its own cone and the resonator’s cone in motion, and lows have a tendency to drag due to the increased inertia. However, it’s important to put things into perspective. First of all, the Klipsch Forte III’s 12” active driver features a lightweight cone set in motion by a powerful motor. As for the passive driver, it is also equipped with a lightweight cone whose excursion is minimized thanks to its large diameter (15”). Klipsch made a sensible choice by tuning its speaker down to 38 Hz even though such a driver could easily reach 15 Hz (the cost being an appalling transient response). The Klipsch Forte III’s passive filter features sizeable condensers and resistors. Moreover, the 12” driver’s cutoff frequency is set to 650 Hz, which means its frequency response is not as extended as that of the Heresy speaker. Consequently, the driver’s efficiency throughout the frequency range it covers is increased. This also implies a very low cutoff frequency for the 1.75” driver, which enhances the transient response in the low-mids. The speakers come with a warranty booklet. 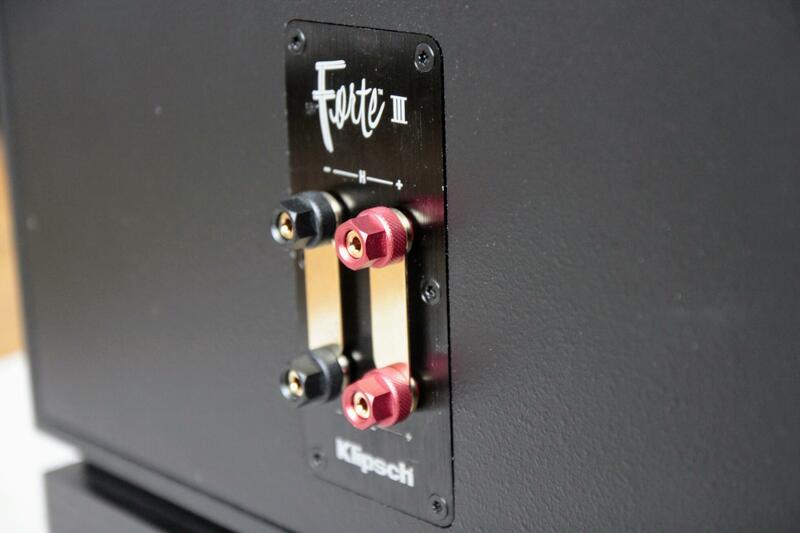 Everything is pre-assembled, and all there is to do is to install the Klipsch Forte III in your room. The base is fitted with semi-circular metal feet, which make it easier to move the two 32 kg (70.5 lbs) speakers. The Klipsch Forte III speaker terminal is compatible with bi-amplification. As per usual, we recommend replacing the metal straps with sections of speaker cable. 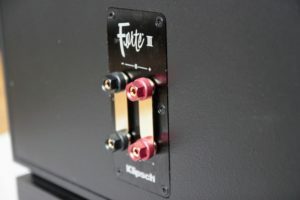 We mainly listened to the Klipsch Forte III using two amplifiers, a Pioneer VSX-S300 (a modest, slimline home theater receiver) and a Hegel Röst amplifier, a much more capable model. We used two different types of speaker cables for our test: the NorStone W250 and the Viard Audio Silver HD12. 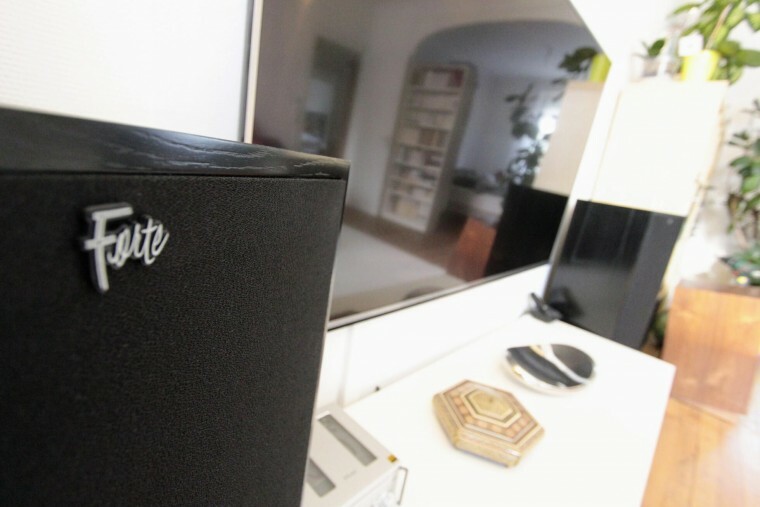 We used the home theater receiver to listen to movie soundtracks and live concerts (DTS HD MA, Dolby TrueHD, DTS and Dolby Digital), while we took advantage of the Hegel Röst’s DLNA compatibility to listen to FLAC files (CD/HD). The listening room was a roughly 30m² (323sqft) living room with a hardwood floor in which we usually listen to a pair of Klipsch Heresy III. The Klipsch Forte III alongside the Teac CR-H101 amplifier. So, how good is this new acoustic horn, and how does the large 15” passive radiator behave? We began our test with a few extracts of Alien: Covenant, a film which had already showcased the dynamic capacity of the Heresy III speakers. The film opens with the powerful thumping sound of rotating machines, which allows the speaker to show off its ability to ensure a nuanced sound delivery. Despite our small home theater receiver, it didn’t take long to observe that the passive radiator was spot-on. The bass delivery is tight and the energy is evenly distributed throughout the low end of the sound spectrum. The long dialogue which takes place at the beginning of the film brings out the incredibly realistic mids, which suffer no hint of harshness. The experience is comparable to what the best movie theaters have to offer. The voices are particularly well delivered, and every breath is restituted with a generous dose of finesse. When the film score joins the dialogues, the soundstage is remarkably layered. The dynamic range of this speaker is striking, and every incremental increase in volume is smooth and serene. In other words, whether it be at high or low volume, the sound consistently maintains a sense of harmony and composure. What caught our attention was the fact that the choice of amplifier had little influence over the speaker’s performance. Some speaker/amplifier pairs result in a stale listening experience. This is not the case with the Klipsch Forte III. These speakers provided an enjoyable experience not only with both our test amplifiers, but also with a Denon RCD-N9 or Teac CR-H101 compact system. Of course, the limitations of these small amplifiers are quickly felt, but the sound quality retains its luster and is never aggressive. With the Teac mini amplifier, the lows are clearly lacking and the dynamic range is limited, but the listening experience is nonetheless exceptional. When paired with the Hegel Röst, the Forte III are a lot more commanding and subtle. Lows: The two drivers are skillfully employed and the restitution of the lower end of the audio spectrum is excellent throughout, with a staggering dynamic range when necessary. When listening to music, the transient response ensures an excellent restitution of the timbre of instruments and vocals alike. For a home theater experience in stereo, the acoustic pressure generated during action scenes never outshines the mids and highs. The Klipsch Forte III is easy to enjoy. A real pleasure! Mids: The 1.75” dome driver delivers an astonishing amount of micro-details, without showing any sign of aggressivity, even at high volume. Highs: The highs are perfectly integrated with the mids and boast an equally impressive dynamic range. No excessive brightness here and loads of micro information, even at low volume. 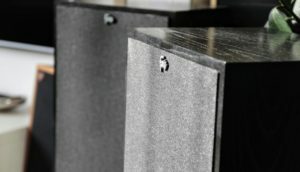 Soundstage: A negligible lack of breadth can be observed when the speakers are both directly oriented toward the listening area. This issue can be easily fixed by carefully reorienting the speakers. The depth of the soundstage is pleasant, and so is the height as long as the speaker’s back is not directly against the wall. It is difficult not to rave about the Klipsch Forte III. Its laid-back delivery, as well as their macro-dynamic and dynamic capacities, speak for themselves and surpass the competition. 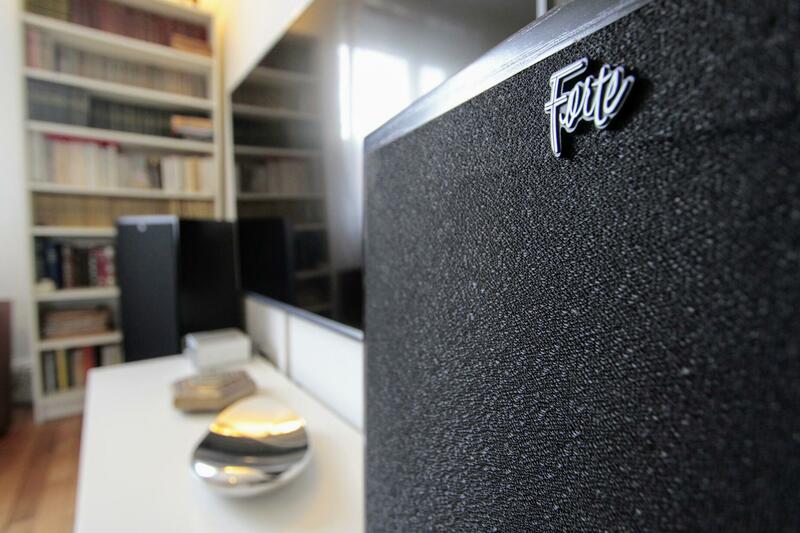 Any amplifier can make this speaker sing, which in itself is proof that this model is a complete success. Give it a few Watts from a digital or tube amplifier and the Klipsch Forte III will take you on a journey straight to the heart of music. A legitimately great speaker.